1) You have to have lived through and remember the socio-economic situation of the 1980’s and agree that it wasn’t great in order for this poster to work. Political parties are meant to be trying to improve the future, not looking back to the distant past. Indeed, a past which is highly subjective and which David Cameron had nothing to do with. 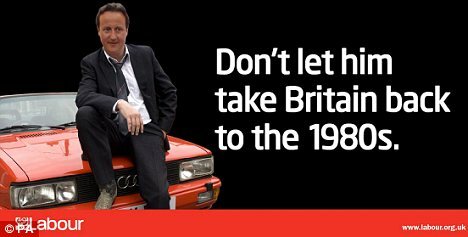 2) You have to have watched the BBC drama ‘Ashes t0 Ashes’, remember that it is set in the 1980’s, recall the lead character Gene Hunt and get that David Cameron has been made to look like him in order to understand this poster. 3) Gene Hunt is like-able, popular and has acquired the status of ‘cult hero’. Why would you want to liken your enemy to such a character? Even worse, the very characteristics which people find lacking in David Cameron – masculine and tough with an everyman appeal – are in abundance in Hunt. 4) Since airbrush-gate, the Tories have not featured their most prized electoral asset – David Cameron – in their posters. This has been beneficial for Labour as it has enabled them to focus discussion on policy and away from personality. Featuring Cameron in this poster has brought the discussion squarely back to personality – Brown v.s Cameron – which favours the Conservatives and makes it more difficult for Labour to highlight Tory policy weaknesses. The list really could go on and on and on. This awful piece of political communication is a real wasted opportunity and has set Labour back a few steps.